Sami school history - 32 - Folk high school against norwegianizing? Folk high school against norwegianization? In 1914 three organizations of mission gathered in a «committee with the aim in sight to start Christian and social work in Finnmark». Soon they agreed to construct a Christian folk high school. It was started in Havøysund in 1917 and got the name Øytun. Former pastor in Porsanger Otterbech was a central member of this committee, and he wanted the new school to have special offers to Sami youth. Former headmaster at The Sami folk high school describes it like this: «To Otterbech it was a disappointment that Øytun was not given the possibility to give a special offer to Sami youth. When they tried to do so the director of schools put the attempt to a halt». In a report in the records of the board of Øytun folk high school there is a summary of a debate concerning the establishing of a separate «special class for Finns», but this was turned down: «It was emphasized that establishing a Finnish special class in the folk high school would lead to loosing the financial support». The first year the school was running a Sami teacher, Hans Baukop from Porsanger, was working there. He later became teacher in Polmak, and there he got into quarrels with the director of schools because he used Sami in the teaching. The school was moved to Alta in 1967, and has been there since. The three organizations that started the school are still the owners. There was a discontentment within the Sami mission that Sami had such a limited focus in the school, and in connection with the moving to Alta in 1967 there were forces which wished for the Sami mission to draw back from Øytun and rather concentrate on activities aimed more directly at the Sami population. Still the majority decided that the Sami mission should continue the collaboration. In the 1970's Øytun introduced Sami leather work as a subject of teaching. Later the school has changed to a complete wildlife profile, with «Sami culture and reindeer herding» as one of the optional courses. 01.03.2002 on the other hand the headmaster at Øytun says to Min Áigi: «that there are no plans to start a separate Sami course of study at the school, but rather to strengthen the Sami profile in all courses of study». Øytun managed to get an extra governmental support, arguing that the school would take over the tasks DSF had. This lead to an increase of the number of students, but no more Sami content in the teaching. 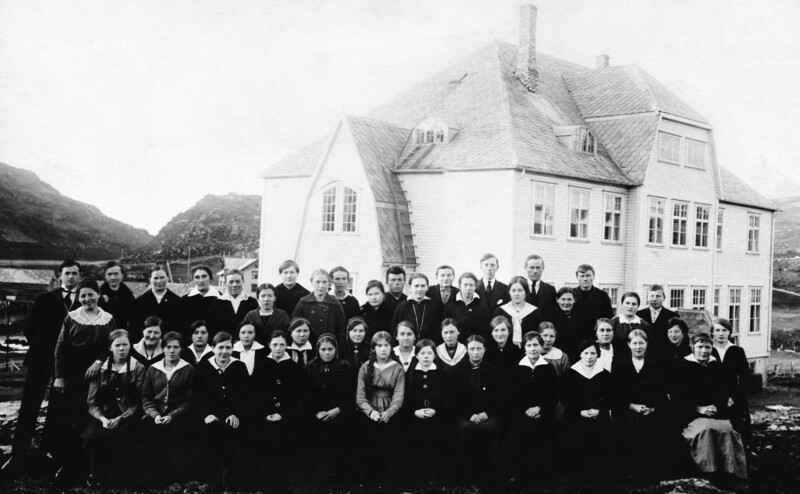 The idea of a separate Sami folk high school was risen from several sources, both Sami and Norwegian. Mainly we can talk about two environments, one within the Sami mission, with Jens Otterbech as initiator, and one in Tana, fronted by Per Fokstad. There was a great struggle concerning wether there should be a separate Sami folk high school at all, and in that case also who should run it. The first who made an attempt to get such a school started was probably Jens Otterbech, already in 1911. When it did not succeed to introduce a Sami offer in Øytun, Otterbech and Finnemisjonsforbundet (...) concentrated even more on developing a separate Sami folk high school. Otterbech fought for the Sami folk high school until he died in 1921. After his death Jacob Børretzen in particular fought for the matter within the Sami mission. It will be established parallell classes in the two county schools in Finnmark and at Øytun folk high school. The language of teaching will be Sami, with the exception of lessons in Norwegian language. It must be calculated a greater number of lessons in Norwegian for Sami youth than what has been calculated until now. — Lectures on Sami culture and the history of the Sami. — Woodwork and needlecraft: Sami handicrafts. Teachers: Sami. Until this has been carried out there should be employed a Sami born teacher straight away in all of the folk high schools. 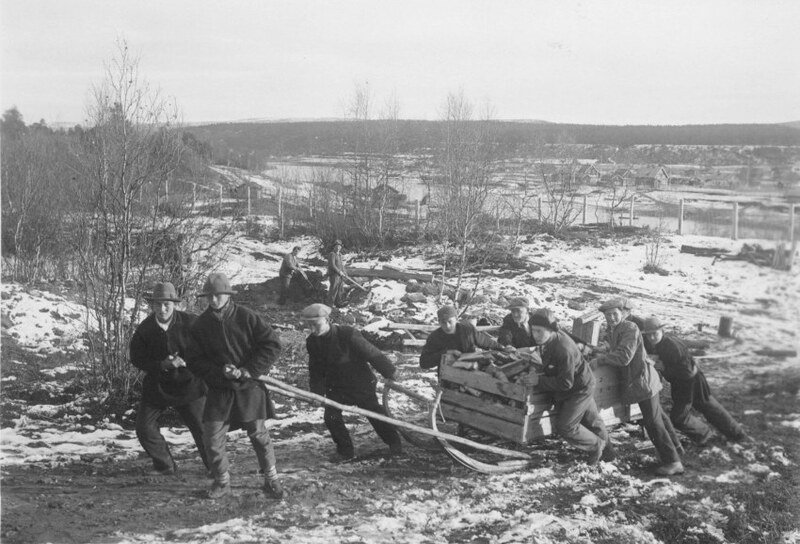 Sami folk high school: Pupils had to carry firewood to the school. Probably the picture is from 1936–38. 1) to ease the transition to Norwegian cultural life without becoming rootless people with some sort of Norwegian beggar culture and 2) to preserve the Sami national values that can endure. An intense discussion rose, for instance in the newspapers. Among those who committed themselves for such a school was the south Sami Daniel Mortensson, editor of the newspaper Waren Sardne. An attempt from the Sami mission to take over the East-Finnmark county school in Tana was rejected by the county council in 1935. At the same time the county council advised not to give governmental support to a folk high school for Sami and expressed that the Sami themselves did not want a separate school for Sami. Again a debate in the newspapers rose, showing that strong forces was opposing any kind of initiative founded on Sami language and culture. On today's frontpage we print an article on Sami folk high school in Finnmark. The secretary general of Norwegian Finnemisjonsselskap (...), Heiervang among other things states that such a school «plainly is a duty of the nation», and furthermore that the teaching will take place in Sami. On this occasion we will not discuss the legitimacy of such a school, but we will pinpoint the citation above from the secretary general. It is a national duty to establish a folk high school with Sami as the language of teaching, he says. We have always believed it to be a national duty to teach all Norwegian citizens to speak Norwegian. In our opinion we have more than enough of language division in the country. We have two equal language variants. Should it now be worked to make a third language recognized with all the official rights?We fear that this will be the consequence. And in that case calling this a national duty is ill-fitting in our opinion. The thought can be well intentioned, but it is not national. The nationality thought is about a united Norway, linguistically and culturally. Not a cleft and divided country. The negative attitude from the county authorities made the Sami mission flare up, and in 1935 the assembly council passed unanimously: «The assembly council urges the main council to look into the possibility to initiate a Christian, moveable folk high school for Sami in Finnmark, and get this started as soon as possible – despite that county- or governmental financial support can not be achieved.» In 1936 the Sami folk high school finally got started, with Ottar Bondevik as the first headmaster. The school did not have it's own housing and the war put a stop to the plans for construction. The Director of schools Lyder Aarseth on the other hand was of the opinion that the Sami mission should continue to run the school. His recommendation was decisive when the Ministry gave it's approval and financial support for the start up. The school was started in 1949, and in 1951 it could finally move into it's own buildings. 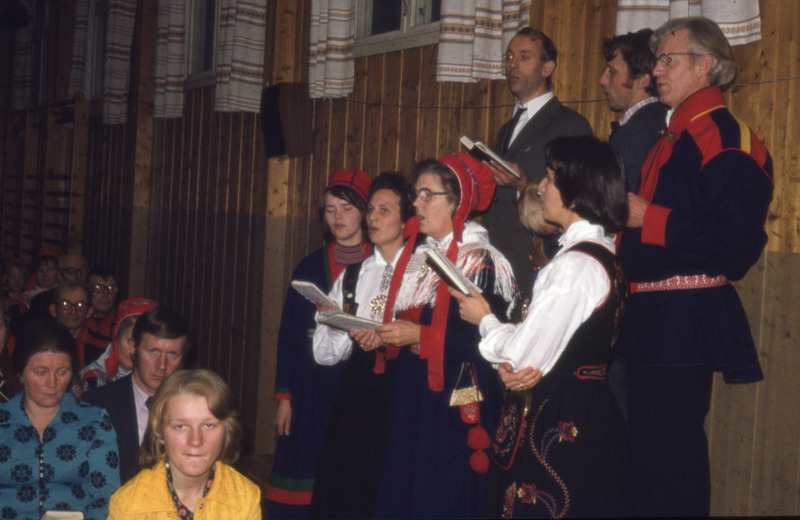 Sami folk high school: Teacher' quiore is singing, 1976. First row from the left: Unni Steinfjell, Oddlaug Vågsås, Åse Ryan, Margot Grimstad. 2. row from left: Herman Vågsås, Arne Ola Grimstad, Paul Ryan.